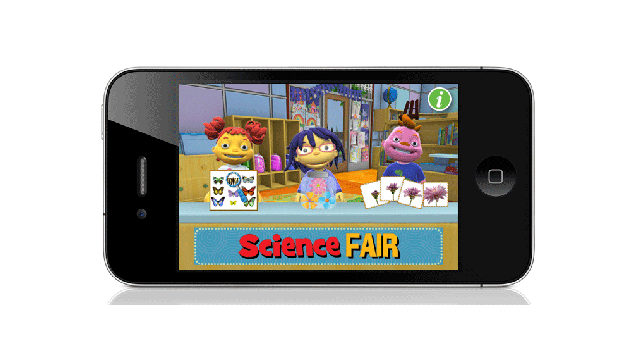 ARLINGTON, VA, September 19, 2011 – PBS KIDS today announced the newest addition to its successful suite of educational apps for iPhone and iPod touch, Sid’s Science Fair, which is available now on the App Store. The app, based on the animated preschool series SID THE SCIENCE KID from The Jim Henson Company, encourages children ages 3 to 6 to explore and experience science. Sid's Science Fair supports PBS KIDS’ curricular focus on STEM – science, technology, engineering and math. Gabriela’s “Collection Inspection”: Choosing from several different exploration environments, children discover patterns in natural objects using an interactive magnifying glass. May’s “Chart It!”: Children use charts to explore a set of objects and then organize ten objects on a chart according to a shared trait, such as color, shape and orientation. Gerald’s “Time Machine”: Children explore how different objects – from food to plants – change over time. They first order the events in sequence, and then the events form into a timeline that players can move forward and backward in time to see the transformation. The SID’S SCIENCE FAIR App is available for $2.99 from the App Store on iPhone and iPod touch or at www.itunes.com/appstore. Images of the SID’S SCIENCE FAIR App can be found on PBS PressRoom. To learn about all PBS KIDS apps, visit PBSKIDS.org/mobile. SID’S SCIENCE FAIR joins PBS KIDS’ STEM-focused line-up of content for kids, including series like SID THE SCIENCE KID, THE CAT IN THE HAT KNOWS A LOT ABOUT THAT! and CURIOUS GEORGE, as well as mobile apps like DINOSAUR TRAIN EGGSPRESS. PBS KIDS is increasingly serving kids where they live, learn and play – helping to make anytime a learning time on mobile devices, on-air, online and beyond. The Jim Henson Company has remained an established leader in family entertainment for over 50 years and is recognized worldwide as an innovator in puppetry, animatronics and digital animation. Best known as creators of the world famous Muppets, Henson has received over 50 Emmy Awards and nine Grammy Awards. Recent credits include the Emmy® nominated SID THE SCIENCE KID, DINOSAUR TRAIN, WILSON & DITCH: DIGGING AMERICA and "Pajanimals." Features include "The Dark Crystal," "Labyrinth," "MirrorMask," and "Unstable Fables" and television productions include "Fraggle Rock" and the sci-fi cult series "Farscape." www.henson.com. PBS KIDS, the number one educational media brand for children, offers all children the opportunity to explore new ideas and new worlds through television, online and community-based programs. For information on specific PBS KIDS programs supporting literacy, science, math and more, visit PBS.org/pressroom, or follow PBS KIDS on Twitter and Facebook.